These modules provide up to six channels of analog output. Multi-range outputs support a wide variety of industrial devices. They can drive displays and recorders, control drives, or send analog signals to other systems. High-resolution, low noise, D/A converters deliver high accuracy and reliability. 3-way isolation further improves system performance. – DC Current (user-selectable ranges). – 0to 1mA, 0 to 20mA, or 4 to 20mA. – DC Voltage (user-selectable ranges). – 0to 1V, 0 to 5V, or 0 to 10V DC. – Better than ±0.1% of span, typical. – 1.6% for 0 to 1mA range. 0.8% for 0 to 1V range. – 12V minimum, 13V typical. – 0to 625 ohms, typical. – 0to 10mA DC, maximum. – 972PB-200x models -25 to 60°C (-13 to 158°F). – 973PB-200x models: -25 to 70°C (-13 to 140°F). 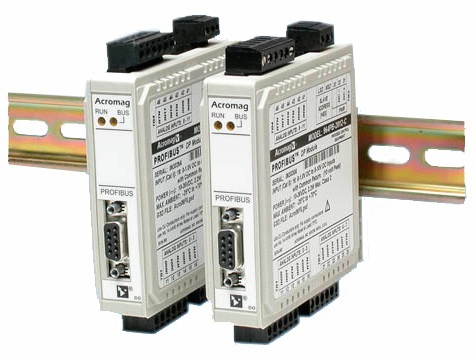 – Isolated, 3-wire RS-485 multi-drop, half-duplex, asynchronous. – Standard ProfiBus DP (Master/Slave) protocol per European Norm EN50170. – Supports rates of 9600, 19.2K, 44.45K, 93.75K, 187.5K, 500K, 1.5M, and 12M bits per second, auto-detected. – Up to 1200 meters without a repeater using Type A wire (<30pF/m). strength test for one minute without breakdown). – Complies with test requirements of ANSI/ISA-82.01-1988 for voltage rating specified. – Immunity per European Norm EN50082-1. – Emissions per European Norm EN50081-1. – Per EN61000-4-3 and ENV50204. – Per EN55022 Class B.
DC current output module, 4 channels.